Fits 5 liter bottles. Choose the sprayer option in the drop-down menu in the order box. This is the best all purpose cleaner. Cleans well for regular washes and won't strip wax. Great for engine bay and fender well cleaning. Made in Germany means high quality. i've been using this auto wash for many years. it does an incredible job on your entire engine compartment. 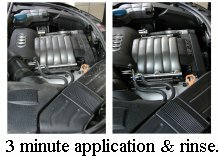 i warm my engine first, spray P21S Total Auto Wash over the entire engine compartment, let sit for 3-5 minutes, agitate with a soft bristle brush, rinse with a medium hard stream of water. start engine & use an air compressor to blow out the water & dry. results are awesome!